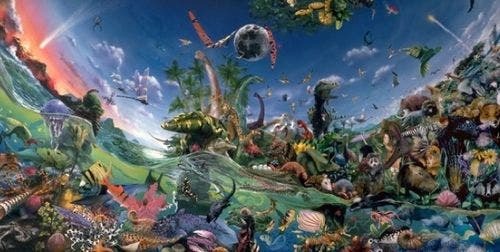 Life on Earth dramatically surged around three billion years ago, possibly when primitive forms developed more efficient ways to harness energy from sunlight, according to a study made by scientists at MIT, who built a "genomic fossil", in essence a mathematical model that took 1,000 key genes that exist today and calculated how they evolved from the very distant past. The collective genome of all life expanded massively between 3.3 and 2.8 billion years ago, and during this time 27 percent of all currently existing gene families came into being, the study suggests. Investigators Eric Alm and Lawrence David said the great surge probably came through the advent of a biochemical process called modern electron transport. This is a key biological function, involving the movement of electrons within the membranes of cells. It is central to plants and to some microbes, enabling them to harvest energy from the Sun through photosynthesis and to breathe oxygen. The big change, which Alm and David dub the Archean expansion, was followed some 500 million years later by a phenomenon known as the Great Oxidation Event, when Earth's atmosphere became progressively flooded with oxygen. The Great Oxidation Event is possibly the biggest species turnover in Earth's history, as primitive or microbial lifeforms that were non-oxygen breathers died out and were replaced by bigger, smarter aerobic forms. "Our results can't say if the development of electron transport directly caused the Archean Expansion," David admitted. "Nonetheless, we can speculate that having access to a much larger energy budget enabled the biosphere to host larger and more complex microbial ecosystems." Early fossils date back to a period called the Cambrian Explosion, some 588 million years ago. But pre-Cambrian lifeforms were soft-bodied and, with rare exceptions, did not leave a fossil imprint. Even so, they did leave a legacy in abundant DNA, which explains the bid to recreate the "genomic fossil" by computer. "What is really remarkable about these findings is that they prove that the histories of very ancient events are recorded in the shared DNA of living organisms," said Alm. "Now that we are beginning to understand how to decode that history, I have hope that we can reconstruct some of the earliest events in the evolution of life in great detail."